My Mom has been here visiting for the past week which means my sewing machine was sitting on a shelf. Last night my husband saw that my machine was out again and he told me that he was glad because I'm happier when I'm sewing. I think that's true. It did give me time to do some hand quilting on my Maple Leaf Rag quilt which has been sadly sitting in the corner for the past couple months. I have now hand quilted all of the octagon shapes, I just need to do the half octagons around the edge of the quilt and the kite shapes. So yeah, that's still a lot, but it felt good to make some progress. Even though I haven't been doing much sewing lately I have been still adding things to my mental list of things-I-need-to-make so I am excited to get to work on some new projects! I love the way that the postage stamp quilts look. Yours is beautiful! Your Maple Leaf Rag quilt is beautiful. Booth of these are so fabulous! Stunning!!! Both of them are beautiful! Both are just gorgeous! I love that postage stamp one though! Your maple leaf rag is so beautiful. It's on my mental to-make list, too! Both of these are gorgeous. 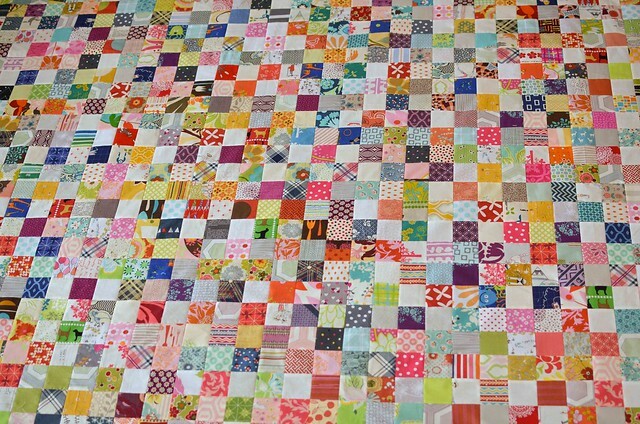 I can't get enough of your leaf rag, it will be an instant heirloom once you finish all that beautiful hand quilting. Still in love with your Maple Leaf quilt. These quilts are absolutely incredible, Erica!!! Love both of them, and the handquilting Sounds gorgeous! 2 absolutely stunning projects, i particularly adore the octagons, so much depth and colour! oh. my. gosh!! that spiderweb quilt is absolutely stunning. I think I actually gasped when I saw it. Love the postage stamp quilt too. The colors are so fun in both of these quilts. If you have a chance, you should hop over and share at Needle and Thread Thursday. It's open through today! Oh, Erica! The Maple leaf rag quilt is just breathtaking! Your hand quilting will make it a treasure for sure! 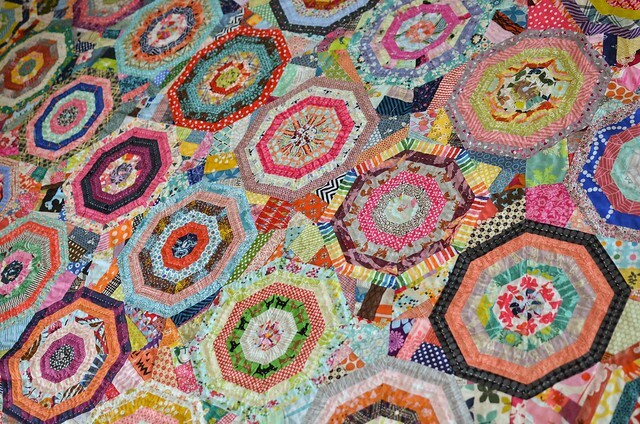 Love the postage stamp quilt too! Wow, your quilting on your Maple Leaf Rag is absolutely gorgeous! And I feel inspired to make a postage stamp quilt after seeing yours! Those are such beautiful projects! Glad you are back to sewing - I feel the same way! I love them both! Very inspiring, I have been wanting to get around to a Maple Leaf Rag of my own one day!